Synbio Technologies’ referral program is available now! Introduce your colleagues and/or friends to the various services Synbio Technologies offers for both of you to enjoy a 20% discount on your next order. Step 1: Login to your account, and go to the dashboard interface. Click “Refer a Friend”. 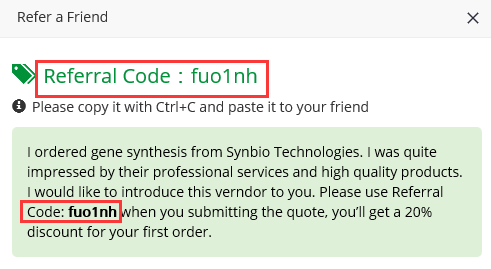 Step 2: Obtain your exclusive referral code and send it to your colleagues/friends (referee). Please note that each account will have a unique referral code. You can send this code to as many people as you wish. Step 3: The referee then enters the referral code at the “Verify” step when he/she submits the request for a quote. Step 4: The referee will enjoy 20% discount for this order. Once the order is confirmed, the referrer will receive a 20% off coupon to use on their next order. Guaranteed 100% sequence accuracy with fast turnaround times. Effective synthesis of complex structures including repetitive sequences, high GC content, and strong hairpin loops. Complete and detailed manufacturing process and documentation. 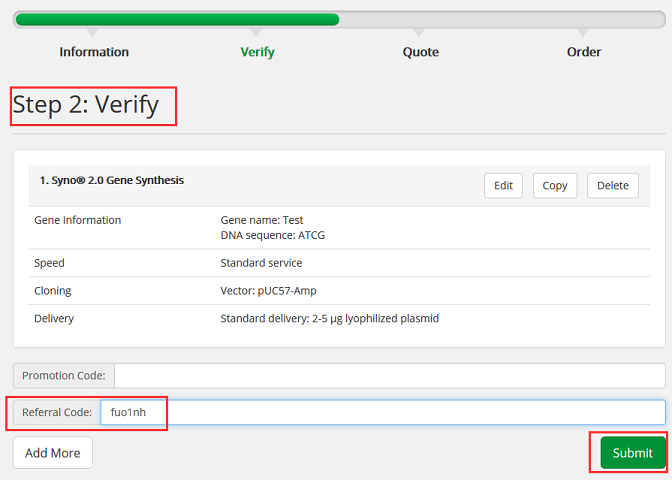 We have successfully designed and constructed nearly 100 sgRNA libraries. Various species including: silkworm, wheat, goat, pig, aedes, mice and human. World leading Syno® Synthesis Platforms, capable of generating high quality synthetic DNA libraries. Library types include: alanine scanning, site saturation, random substitution, and antibody.